Internet sans fil gratuit est inclus avec cette villa fraîchement rénovée avec une nouvelle cuisine, trois nouvelles salles de bains, et un patio personnalisé agrandie avec salle à manger extérieure et mobilier de vie. Il comprend également tous les nouveaux meubles, accessoires, lits, draps et décor. La cuisine entièrement équipée, barbecue et de nouveaux appareils ménagers permettent une villa relaxante et pratique pour profiter de votre temps à la maison, avec la commodité de Maracuya Beach Club, l'un des meilleurs restaurants de la région, juste à la porte. La piscine à débordement sur deux niveaux, la plage et l'océan sont également 30 pas et rend Flying H Villa le plus recherché sur la propriété Bahia Pez Vela. Cette chambre 3, 2 1/2 salle de bain, 2150 pieds carrés villa, est disponible pour location à la semaine. Cette conception à deux niveaux est l'une des quarante villas, sur une crique isolée, ce qui en fait une belle escapade. Villa comprend, TV, Internet sans fil, laveuse et sécheuse, et une cuisine entièrement équipée. Air Central avec des ventilateurs de plafond dans chaque chambre, et une merveilleuse brise de mer et sons de l'océan sur la terrasse. Service de nettoyage et de sécurité 24 heures, sont là pour votre commodité. pêche de classe mondiale et des excursions de plongée partent de notre plage et excellente plongée en apnée, est juste au bord, ainsi que des massages, disponibles sur la plage. Canopy aventures, les volcans, les spas, les parcs nationaux et les visites de la faune, sont parmi les nombreuses excursions d'une journée, qui peut être organisé à partir du bureau. Un merveilleux personnel est sur place, pour faire de votre séjour au Costa Rica un séjour mémorable. Le village de Playa del Coco est à seulement 3 kilomètres et offre de nombreux restaurants, magasins, bars, banques, épiceries et un casino. En possession de Bahia Pez Vela depuis 14 ans, nous savons que cette villa en front de mer serait une excellente option pour nos locataires. S'il vous plaît voir les commentaires de notre autre propriété VRBO, 87837. 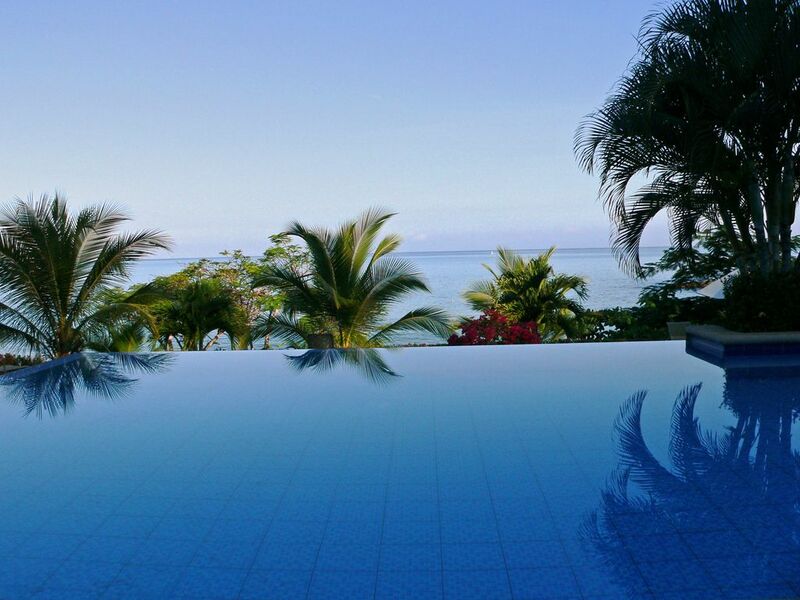 Venez profiter du meilleur du Costa Rica à la Villa Flying H! S'il vous plaît renseigner sur la disponibilité. Trip and Accommodations of a Lifetime! My friends and I planned this get-away to celebrate our 50th birthdays. As we arrived at the village to much a surprise, but a beach bag with coffee, champagne, juice and birthday cards for each of us, along with a huge sign - was such a welcoming gesture. Verda did a great job of giving us recommendations for everything under the sun to do during our stay. We were thrilled with everything - Arenal Rainforest hike, Rincón de la Vieja Volcano National Park, Cortez Waterfall, Conchel beach, grocery stores, restaurants and massages right on the Flying H Villa patio. As we first arrived the view of the pool and beach took our breaths away. We giggled about how we hit the jackpot with this beautiful secluded hideaway. The villa was just as thrilling as it had everything one would need and more. Decorated with such class and extremely comfortable beds, patio outside the master bedroom, awesome kitchen, laundry and the best was the patio right off the beach and next to the pool. The sound of the waves was so relaxing. We saw and heard Howler monkeys, raccoons, Magpie Jays and hermit crabs on the beach at night. I highly recommend the Flying “H” Villa for your stay in Costa Rica. The only disappointment was we should have stayed at least another week! Until next time.,. Our family had a wonderful stay at The Flying H Villa. The stunning view of the black sand beach from the very well apppintrd patio was mesmerizing and where we spent most of our time when not at the pool or doing one of many activities Costa Rica is known for. The villa is absolutely beautiful decorated with so many lovely details and had everything our family needed including beach towels, floats, coolers, and a fully outfitted kitchen. From the start of our reservation Verda and Neil were great to work with. They provided lots of information about the area and answered all our questions promptly. I also can’t say enough about the staff at Bahia Pez Vela! You have all the amenities of a boutique resort with a full service pool and a team who want to make your stay outstanding. Cesar was always there to fill any request we had from making our poolside beverages to renting SUPs and kayaks for use on the beach or arranging for zip line adventures. We did not do this but we saw a few guests getting picked up right on the beach for their boating excursions. The on site restaurant Maracuya was excellent and so convenient to our villa, just a few steps away but separated by lots of landscaped foliage so while on the patio you didn’t even know it was there except for hearing occasional live music which just enhanced the tropical atmosphere of the property. One night they delivered dinner to our villa when everyone was very tired from the day’s activities! They only serve lunch and dinner though. The landscaping is very impressive with so many flowers even in a very dry season. The team worked tirelessly to keep the property spotless. We saw monkeys, jumping manta rays, dolphins, and many birds right from our patio. The town of Playa del Coco is a short drive away and had many restaurants and services. Father Rooster on Playa Ocotal was a very cool restaurant right on the beach. The villa’s location is also an easy drive from the Liberia airport, national parks, waterfalls, zip lines, and many other beautiful beaches (although we loved the beach right outside our door best as it felt like our own private beach with plenty of shade and a choice of lush grass or stunning black sand which sparkled with flecks of gold in the sun). We are definitely missing being at the Flying H at Bahia Pez Vela and are already dreaming about our return. Convenient location, fantastic view, quiet resort, comfortable lodging, well-stocked kitchen, lovely uncrowded beach, hospitable staff! Neil and Verda are very conscientious owners and gracious hosts. The condo receives my highest recommendation! The only disappointment was the dinner at the restaurant. The food was okay and the restaurant seemed understaffed and disorganized. The lunch food was better. That would not deter me from returning! Gorgeous villa and perfect location. My husband and I spent a week at Bahia Pez Playa Ocotal with our son and his family. Our expectations were surpassed with both the villa and its location. The villa is beautifully decorated, spacious, immaculate and fully equipped. A large patio overlooking the beach includes both a seating and eating area. The owners Verda and Neil were extremely helpful in providing information to assist us in making our holiday perfect. The beach, pool and an excellent restaurant are short steps away. The staff was very friendly and accommodating. We were able to make plans for tours, fishing, etc. right on site. The restaurant staff also provided some entertainment for our grandsons such as a make your own smoothie class and they made a ceviche from a fish my son caught. The supermarket is in Coco Beach which is only a short drive. Many locals speak some English which made shopping effortless. We highly recommend the Flying H villa and hope to return sometime soon. Amazing ...... everything was perfect and beautiful. The villa was beautiful, the views were amazing, the owners were fantastic to work with. The ocean is right in front of you, the pool and restaurant is right next door. We had a chef come in and cook for us and got massages on the beach. Restaurants in town ere good but if you just wanted to hang out and stay at the villa to enjoy the sights and sounds you could. Loved the comfy beds and each couple had a glorious view of the ocean. It was spotless, safe and decorated beautifully. Not to mention the howler monkeys, whales, and birds right outside your door. I highly recommend this villa. We’ll be back! Fantastic vacation for my family! Highly recommend staying here! We loved every minute of this vacation and our accommodations were absolutely wonderful! The villa is beautiful, clean, well-stocked and just steps from the water. Verda and Neal are great hosts. They supplied us with all the information we needed to make the trip easy and low stress. The villa is part of a resort with the main pool and a fantastic restaurant close by. All 5 of us all felt like we could be happy never leaving the property; however, we did leave because there are so many fun excursions to do and town is nearby with many stores and lots of people watching! I definitely recommend a massage on the beach by the villa. We did it twice! The divers in the family had a good experience with Rocket Frog Divers. When we weren't out seeing sights, we were lounging in the pool, talking about the day, watching the sun set, and ordering food which was amazing. The kitchen is very well-stocked for cooking at home if you prefer. We will be back! Thank you!